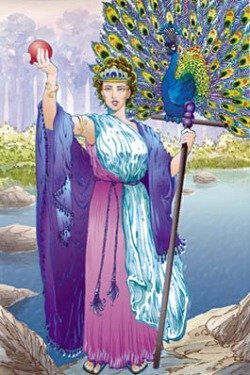 Hera is a Greek Great Mother Goddess who originally was worshiped as a Goddess of abundance and fertility. Eventually she was married off to Zeus (others invaded Greece and changed Hera's story line). Zeus was constantly taking lovers and having extra marital children. Hera didn't like this very much and spent a lot of time hunting down and punishing Zeus' lovers and keeping vigilant watch on Zeus. This caused Zeus to become extra-sneaky and there are many tales of Zeus trying to put one over on Hera. Eventually Hera was portrayed as a vengeful, spiteful Goddess, but in truth She was trying to protect Her position and Her children’s inheritance. Hera favors women and people born under the sign of Cancer. She is described as a radiantly beautiful woman who shines like the sun, but She can also shape-shift. One of her favorite disguises is an old beggar woman; in this form Hera tests your compassion. If the beggar is not treated with respect, Hera will administer justice. One of her favorite forms of punishment is to cause instant insanity to those she is angry with. Hera's two main symbols are the cuckoo for Zeus' love for Her (Zeus was disguised as a cuckoo to win her love) and the pomegranate for fertility and child-birth. Other symbols are the peacock for immortality, the scepter for justice and the diadem and veil to symbolize Her queen ship and the hidden mysteries.